We have a comprehensive range of EMC or EMI Shielding Ventilation Panels and filters available that are all primarily designed to allow unrestricted air-flow whilst preventing the transmission of electromagnetic interference (EMI). They are used wherever there is a requirement for air cooling or to allow ventilation without compromising the shielding integrity of an enclosure. The most commonly used type of EMI Shielding vent is based on aluminium honeycomb panels mounted in an extruded aluminium frame. 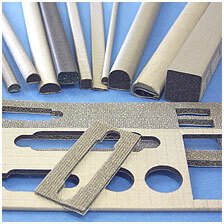 The honeycomb media has a very high open area and therefore allows good air flow with minimal pressure drop. In order to achieve the best shielding performance two layers of honeycomb are used orientated at 90° to one another, although this is not always necessary on some less demanding applications. The exterior facing honeycomb layer can be angled (usually 45°) so as to direct airflow in a particular direction or to deflect rain or spray. Whilst this can be a useful feature to include in a vent design it should be borne in mind that it will impede airflow, particularly at higher air speeds. Thin vent panels, or thin screen shields (TSS), are designed for applications where space is limited, and eliminating the use of full size honeycomb vents. 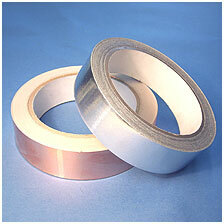 More Information on Low Profile EMI Shileding filter panels can be found here. 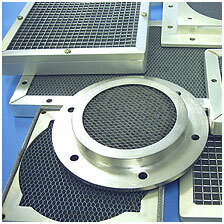 Electronic filter and dust shields perform three functions. They attenuate RFI, provide for the passage of cooling air and filter large dust particles from the airflow. They provide maximum dust trapping effectiveness, yet cause reasonably low resistance to air movement. There are also some types of vent designed for very high levels of performance and / or more arduous conditions. There are two methods of construction that can be used if this is the case. The vent can be machined from a solid aluminium billet or plate. The open area of the vent is created by a drilled matrix of holes that utilises the waveguide beyond cut-off effect of holes that have a diameter approximately one quarter or less of there length. 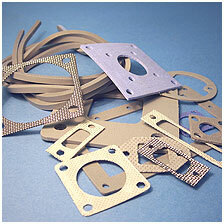 We stock a range of low cost EMC vents for use with 40mm, 60mm, 80mm, 92mm & 120mm fans. They provide EMC shielding where applications demand a low cost solution, whilst still providing an adequate shielding performance.